The two biggest fighting games of the 1990s were Mortal Combat and Street Fighter. Mortal Combat caused a storm due to its violent death scenes and excess blood. The game is often credited with the introduction of the age certification system on games. Street Fighter was less gory and was a more tactical fighter with lots of complex moves to learn. The screenshot for this game shows that it takes its influence from the Street Fighter games. The game should work on any Amiga with 1 meg. I did have some problems with the version I was using on an emulated Amiga 500 with kickstart 1.3 but I am guessing that the game should work fine on the real Amiga 500 hardware as long as it is expanded to 1 meg. The game can be played either against the computer or against another human player. There are five levels of difficulty to choose from if you are battling the computer. The 2 player games are perhaps the best option as they will create the more memorable experiences as you batter your opponent on screen and mock them as you finally defeat them. The graphics to the game are very professional. The sprites are large but move smoothly on the screen. There is a clear inspiration from the Street Fighter games in the design of the fighters. 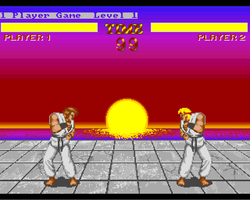 The game tries to match the wealth of combat moves which were available on the SNES Street Fighter game. The game input system is a joystick which makes this harder as it tries to compete with a four button controller. 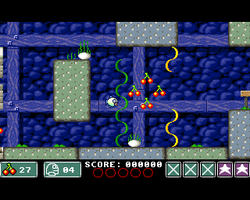 The player has a total of 24 actions - 8 movement actions made by moving the joystick in the required direction without pressing the fire button. Pressing the fire button whilst standing still will activate one of the 8 combat moves including Round House, Sweep, Front and Low Kicks as well as jabs and punches. A further 8 combat moves are available by pressing fire whilst moving. There are also special moves which can be accessed as well. Overall this is a very polished and well executed game. If you want some mindless violence then you won't be disappointed. One of the delights of playing computer games in the 80s and 90s was reading the extremely long and far fetched stories explaining the world the game was set in. The back story for Falling Down, a former F1 Licenceware game, reminded me of how bonkers some of these stories were. "Many years ago on a distant planet lived a race of rather friendly creatures who went about their business not worrying about anyone else, however one dark day an evil lady approached the planet and confronted the little creatures and asked them to join her. Sadly, half of the planet agreed that it was good and so they went with her, the others remained. A year passed and the adventurers returned, but the evil woman had altered their thoughts, and they wanted the planet for themselves. This of course was wron. A traveller arrived and saw the evil consuming the planet and devised a way to stop it, but it wasn't going to be easy. A huge tower was created and in its network the creatures were placed, all tat was left to be done was to get the bad creatures to fall down to the bottom and keep the goodies in. Once this is achieved the evil would be banished." Basically all you need to do is add or remove the supporting platforms that are shown in each column. You need to think carefully about which platforms you add and which ones you remove as you need to save the red creatures from hitting the bottom whilst ensuring all the blue evil ones plunge to their death. If you enjoy the game read our interview with the programmer Paul Huckstepp. During the 1990s the great console wars were taking place between the Sega Mega Drive and the SNES. This battle seemed to become personal as it spread from the console themselves to the lead mascots for their respective platform games. The SNES had the slow paced but clever level layout of Mario and Sega had the super fast Sonic the Hedgehog. The Amiga only had a couple of commercial clones for these games which managed to reach the same level of quality - the Great Giana Sisters stole shamelessly from Mario and James Pond 2 tried to replicate the elements of speed from Sonic. 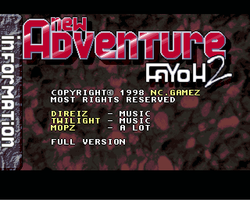 The New Adventure Fayoh 2 seems to take its inspiration from the Mario games. Therefore the game is slow paced and involves the usual jumping to knock overhead blocks to reveal goodies whilst avoiding the baddies who patrol the levels. 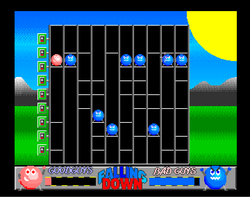 The game started life as shareware but the author has kindly made the game freeware and is easily available for download from Aminet. 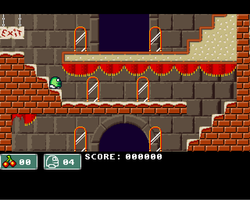 The game is the sequel to Fayoh which was another Super Mario clone platform game. There are clear improvements on the first game in terms of graphics and the game is larger with more levels for the player to enjoy. All the usual elements of a Super Mario Clone game are present and the game is presented in a very professional manner. The game was developed for the AGA amiga hardware and therefore will not run on the Amiga 500 or 600. 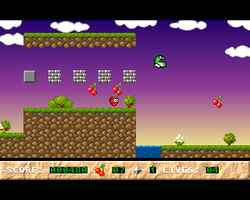 The graphics show some improvement on the old Amiga 500 games - mainly the backgrounds to the parallex scrolling levels. The main sprites lack the detailed animation shown in platform games such as Disney's Aladdin but still manage to have a charm of their own. Fayoh 2 was the last game Marcus Johansson made for the Amiga. It is a shame that this is the case as the series was improving and it would have been interested to see what additional features would have been added to Fayoh 3. As this is the last Fayoh game it is a shame that there is no level editor as this would have enabled fans to create additional levels and would have extended the life of the franchise. In conclusion, if you love Mario Super Mario world then download this game - you will love it. If you prefer the speed of Sonic games then you may prefer Quik and Silva (reviewed in earlier months) but still give this game a go - it has been put together with so much care and attention that it would be a crime to ignore it.